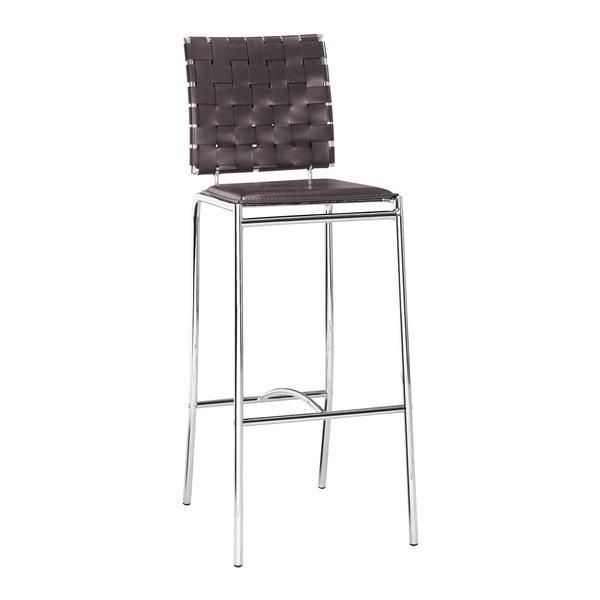 Here�s a bar stool that�s a right-now take on a classic. The Criss Cross Bar Chair from Zuo has the gleaming tubular frame and basket weave seat and backrest that Mid-Century Modern fans will recognize from post-WW2 outdoor lounges and chairs. Here it�s upgraded with great style to enhance any bar, indoors or out. The steel tube frame is gracefully reinforced with a curved stretcher, and the back and seat are woven in a smooth, glossy faux leather. A selection of chic colors is available, so pick the one that harmonizes with your home d�cor. Hi! We wanted to know if it is possible to get 3 of these chairs? We don't have enough room for 4 of them, but 2 is not enough. thanks! Unfortunately we are unable to sell a qty of 3 units of the Criss Cross Bar Stool, as the manufacturer packages this item to ship in quantities of 2. I apologize for the inconvenience.